I really laughed when these came out, but I'm not laughing now. This is the most comfortable thing I can put on in the morning or when I'm working at home! The Snuggie/forever lazy came out about 5 years or so ago and it's sold literally billions of dollars worth in that time. I remember watching the Snuggie commercials and thinking how stupid this was. "Why wouldn't someone just buy a robe?" I would yell at the television. Others around me would try to convince me that it's better than a robe. I wouldn't budge. I thought the very concept was ridiculous and the commercials worse, who's going to wear this thing outside? Unless you're on a midnight trip to Walmart where everyone who goes there is wearing bath slippers and "jammies" I can't see anyone really wearing these with their friends without getting laughed at. That was the old me, the acting in ignorance and judging too quickly me. I digress though, as I was finally convinced (by myself mind you) to purchase one just for kicks. It wasn't on television that this happened- it was a trip to Bed Bath and Beyond that did me in- and I'm glad it did. This is the most comfortable ensemble I've ever felt! It was then that I discovered the newest version of the "Snuggie" by a completely different company- an upgrade really- called Forever Lazy. This version is not open backed, it's sleeves are not overzealous (large cups at end), and it's incredibly close to a pair of pajamas, not a loose blanket. Overall this new version/model really brings me to nostalgia of when I was a kid wearing "footies" pajamas. 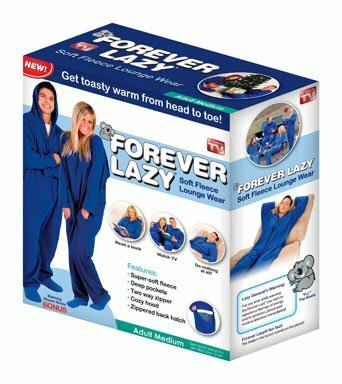 It boils down to preference but I think the Forever Lazy is the better catch. The Snuggie has many more options and styles, but the design is a bit too "loose fitting". Below is an informative video on the creators of Forever Lazy, it's inspiring! So me and my fiance' were on a routine shopping trip to Bed Bath and Beyond. They carry so much more than bath and body stuff there. My favorite section is the "as seen on TV!". Ironically that wasn't where I saw the Forever Lazy I bought. It was on a shelf just before you hit the checkout stand. I noticed that the standard colors can be found in stores (if they still carry them) but online you have more choices. For function the Forever Lazy is best, for aesthetics Snuggie has thousands upon thousands of choices from sports to even one that looks like harry potters outfit, wonder woman, superman, the list is unending and cool! They both keep you warm but the Forever lazy I feel is more convenient and portable (if you dare wear it outside). Need A Halloween Costume That's Comfortable and Warm? Try The Northwest "snuggie" like gear! Wonder Woman Comfy Throw Blanket With Sleeves "Being Wonderous"
Enjoy the comfy, warm feeling of being completely surrounded in a throw, but having the freedom to still use your hands! Made from 100% Polyester, this adult-sized, fleece snuggy-blanket with sleeves simulates the costumed figure of Green Lantern. measures 5' high and about 50" across. he'd of looked better in a Forever Lazy! Seeing one in person was much more of an up-sell than a television commercial. I opened the box to feel the material- I had to see what was all the craze. The material is a fleece like material although I hear they use "innovative" materials- it's likely just fleece (I love fleece though, so soft!). It was incredibly soft and the price was 10.00 not 20 as advertised on TV (although to be fair you get 2 for 20.00 on TV but no option to just pay for 1). I thought, "its only 10 bucks, what the hell". I bought one (royal or electric blue, my favorite color for its vividness) and took it home. I immediately was excited to try it on. It only took one try to really love this thing! Unlike the Snuggie the Forever Lazy fits well and makes the wearer look cute! I caught my fiance borrowing mine and she was absolutely adorable in it! When I wake up in the morning I'm ALWAYS freezing cold. It's the blood not circulating much during sleep, I assume, but the fact is I always have to put on a bunch of clothes to get warm but with the Forever Lazy I just throw that bad boy on and all is good. It seems to regulate my temperature just right, not too cold, not too hot and even in really cold weather it is warm. I sit at a computer most of the day and I love fresh air from outside but it can get cold, the Forever Lazy and Snuggie works well for that too- now I can breathe and stay warm. They also come with these spiffy "treaded" socks to wear with it outside. I wore those for a few days and can't find them now lol, but normal socks work just as well. I vowed never to be caught dead in this thing at first but now I don't care. I was sitting at my computer in a warm Forever Lazy one day when 5 Deer were standing right outside my back patio (no fence, just an open patio). I ran to get my camera to get a shot (and got one (see below) but I chased after them for a good 300 feet out in the open sunny day where all could see me :) and I wasn't embarrassed. I go out to the mailbox in my Snuggie and can feel the eyes on me from the cluster of townhouse apartments in the neighborhood but I think someone is thinking, that looks comfortable! It IS! I went out and bought another 5 of these things just in case they stop making them! (and a few for my family). Your kids will likely laugh at first but will want to borrow it! For Christmas this year I'm buying everyone a Snuggie, I'll give them the receipt so they can take it back but you know what- I doubt they will when I force them to put it on during presents opening :) When everyone is wearing them you feel this sublime comfort like sitting in a room full of plush teddy bears! 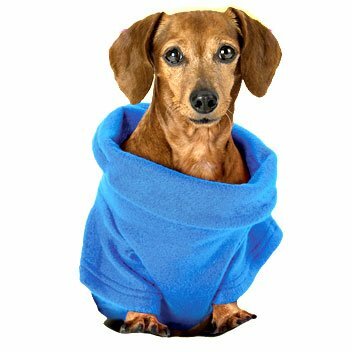 So now you know about the snuggie and the more improved "Forever lazy" but did you know that the Snuggie brand makes a dog version too? I don't know why Forever lazy didn't come up with one or why they only have 8 colors (more coming they say), but when it comes to our pets this is a great idea. The dog version has no open back, fits over any dog easily and actually stays on. It's not the most adorable thing I've ever seen but it works. Pet owners have been purchasing sweaters and the like for their animals forever, so this isn't new but the fact that this material is so great, your dog will love you for it (over that itchy sweater version)! Below are some available colors and types. They make them in sizes for small and large dogs. if you do come back here to get it :). It's quite comfortable, too comfortable sometimes- I can get to feeling real lazy wearing it- so it works haha... I wear mine every day, since I work 100% from home I can wear it in leu of clothes when I'm feeling lazy- it's nice to go to work in a forever lazy! BTW I'm wearing my Forever Lazy as I wrote this!